We are gearing up to make another delivery of blankets! This one will be going to Cooper Cancer Institute in Voorhees, New Jersey. 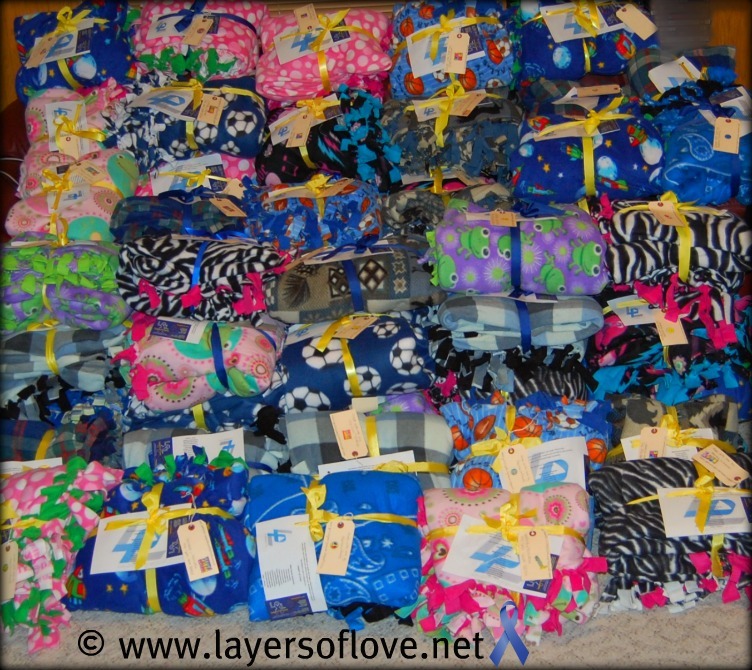 We deliver a lot of blankets both in bulk amounts to cancer centers and individually requested blankets for those who contact us privately ( patty@layersoflove.net ) to have one shipped out for a loved one going through chemotherapy treatment. Our mission statement is Layers of Love: Comforting chemotherapy patients one blanket at a time. But here is what you might not know. Handmade tags, Marissa made for each blanket. Every blanket has a story. Every blanket donated to us has been handmade by someone who cares enough to take the time to donate a blanket. This holiday season we have received many donations from across the country. Many times I just receive the donated blankets, and all I know is the address of where it was shipped from. But when I do know the back story it makes the blanket come to life. When I deliver that blanket I can tell the chemotherapy patient where it came from and any other fact I know about the person(s) who made it. When I started Layers of Love, it was mainly because I wanted help curtail one of the terrible side effects that chemotherapy patients endure while going through treatment, being susceptible to cold. I wanted to help provide comfort and warmth. What I didn’t know is that not only will the blanket provide the patient with physical comfort and warmth, but it would also provide emotional comfort and warmth. It is emotionally uplifting to know that a stranger has cared enough to donate a blanket for them as they go through their treatment battling this terrible disease. It touches their hearts. You’ll remember Robyn, from our last post Ordinary People Doing Extraordinary Deeds and her incredible drive for Layers of Love. Now it’s time to let you know about another member of her family, who has done and equally amazing drive for us. Marissa is Robyn’s 12-year-old daughter. Robyn and Marissa were looking for a project that Marissa could do for her upcoming Bat Matzvah. When Robyn and Marissa found Layers of Love, they went right into action! Marissa put together a blog: Get Cozy During Chemo and began her blanket drive. She set up a donation link on her blog so that anyone could help out her drive by donating money so they could purchase the fleece to make the blankets, her Mom sent out emails to all their friends to let them know what Marissa was doing, and they were off and running. After raising money to purchase fleece fabric she set up her first blanket party and over 60 friends and family came out to help put together the blankets! After her first blanket party, Marissa had a second blanket party hosted at her Mom’s favorite clothing store Emily Grace. It was an all day event, where you could come in to the store, donate toward a blanket, help put together blankets, and shop for a 20% store wide discount. They made 45 more blankets at the party! WOW! Marissa’s Bat Mitzvah is in May. She set a goal of 180 blankets to donate for cancer patients. Why 180? Derivatives of the number 18 symbolize “life” and “good luck” in Judaism. 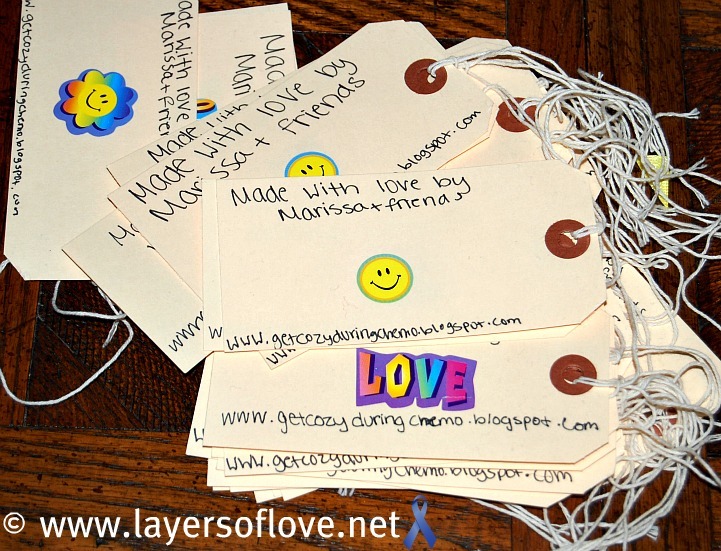 You can also read more about why Marissa picked Layers of Love, and why she wanted to donate blankets for chemotherapy patients in her Why blankets? …..My story post on her blog. Marissa loves hanging out with her friends and loves cheerleading. Just a portion of the donated blankets from Marissa ready to out for delivery. Marissa is another example of an ordinary person doing extraordinary deeds. She is a wonderful young lady. These handmade fleece blankets will be so welcomed by the chemotherapy patients they will be donated to. They will provide comfort and warmth both emotionally and physically. We are so grateful to both Marissa and Robyn for their hard work, and their amazing inspiration. Both Marissa and Robyn are truly making a difference to so many people. Thank you for all that you do, thank you for all that you have done. Thank you for all the blankets. Thank you. This entry was posted in Chemotherapy Patients, Donations and tagged blankets, cancer, Charity, chemotherapy, collaboration, collecting, comfort, delivery, difference, donated, donation, Donations, fleece, fleece blankets, giving, good cause, grateful, helping, layers of love, patients, thank you, warmth. Bookmark the permalink. Our Mission is to raise awareness for childhood cancer and to provide financial assistance to families of kids with cancer. Together we can make a difference, helping one family at a time!